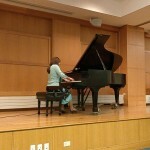 I am a pianist and music teacher currently residing in Arlington Heights, IL. I hold an Associate of Music degree in piano performance and pedagogy from St. Petersburg Pedagogical College (Russia), and taught music classes in preschool and elementary schools. I also hold a Bachelor and Master of degree in Speech - Language Therapy and worked with children as speech language therapist. I am currently pursuing becoming a Nationally Certified Teacher of Music (NCTM) and Certified SLP (ASHA). I am a member of Music Teachers National Association (MTNA), and actively seek to stay current and further her professional development as a teacher and therapist. Let others know about Ms. Janna. Did this teacher help you to learn? How long did you take lessons? Are you still playing music? Share any thoughts or stories you have so that others can know about this teacher!